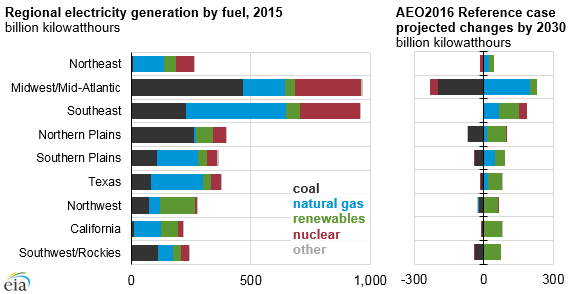 EIA's Annual Energy Outlook 2016 (AEO2016) Reference case projects that natural gas-fired electricity generation will exceed coal-fired electricity generation by 2024, while generation from renewables—driven by wind and solar—will overtake coal-fired generation by 2029. The shift away from coal-fired generation to a combination of higher natural gas-fired and renewables generation and greater energy efficiency is expected to be accelerated by the U.S. Environmental Protection Agency's Clean Power Plan (CPP). Notably, the share of natural gas-fired generation exceeded coal-fired generation in 2016, according to EIA's latest Short-Term Energy Outlook. 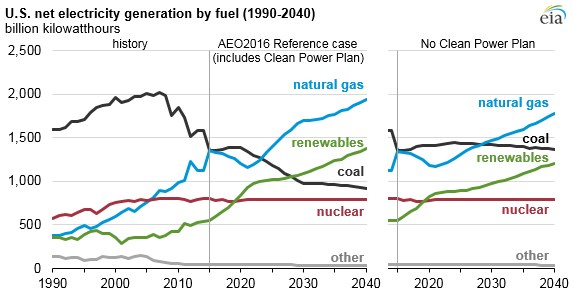 However, in the AEO2016 Reference case, the natural gas-fired share of generation declines temporarily after 2016, then resumes rising in about 2020 and once again exceeds the coal-fired share in 2024 and throughout the rest of the AEO2016 projection to 2040. Even without the CPP, significant growth in renewables generation is projected throughout the country, due in large part to Congress's recent extension of favorable tax treatment for renewable energy sources. From 2015 to 2030, for the nation as a whole in a scenario where the CPP is never implemented, EIA projects that renewables generation will increase at an annual average rate of 3.9%, while natural gas generation will grow at 0.6% per year. In the Reference case, which assumes the implementation of the Clean Power Plan, renewables and natural-gas fired generation grow at 4.7% and 1.6% annually from 2015 to 2030, respectively. EIA's analysis of the U.S. electricity market is divided into 22 regions, which in this discussion are further reduced to 9 regions shown above. The current generation mix across these regions varies considerably, with significant differences in the use of fossil-fuel, nuclear, and renewable energy sources. Certain regions such as the Midwest/Mid-Atlantic, Southwest/Rockies, and Northern Plains—regions that are home to much of U.S. coal production—tend to have greater reliance on coal-fired electricity generation. These regions have among the highest CO2 reduction requirements and are expected to have the largest shifts in their generation mix. In the Midwest/Mid-Atlantic region, a large decline in coal generation is offset by an increase in natural gas generation and relatively modest growth in renewable generation. 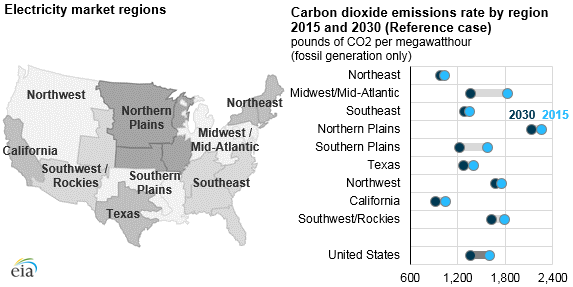 These projected changes are expected to result in a 26% decline in the Midwest / Mid-Atlantic region's emission rate—from 1,826 to 1,357 pounds of CO2 per megawatthour, the largest drop of any region in both percentage and absolute terms. The Southwest/Rockies region is projected to see an expansion of renewables generation that is nearly twice as large as the decline in coal generation. In the Northern Plains region, a decline in coal generation is exceeded by a slightly larger shift to renewables generation, with smaller growth in natural gas generation. Other regions, such as Texas, the Southern Plains, and the Southeast, rely more on natural gas-fired generation. The projected decline in these regions' coal generation is more modest, and they all are expected to see strong gains in renewables generation, with some additional growth in natural gas generation.